EMPLOYING 21ST-CENTURY TECHNOLOGY – Yukon Energy president Andrew Hall explains the planned smart devices pilot project during Friday afternoon’s news conference. A $1.3-million, two-year pilot project to investigate the feasibility of using smart devices across the Yukon grid was unveiled Friday afternoon. The intent is to sign up 400 Yukon homes whose occupants are willing to have their use of electricity monitored and controlled remotely by Yukon Energy using the devices. 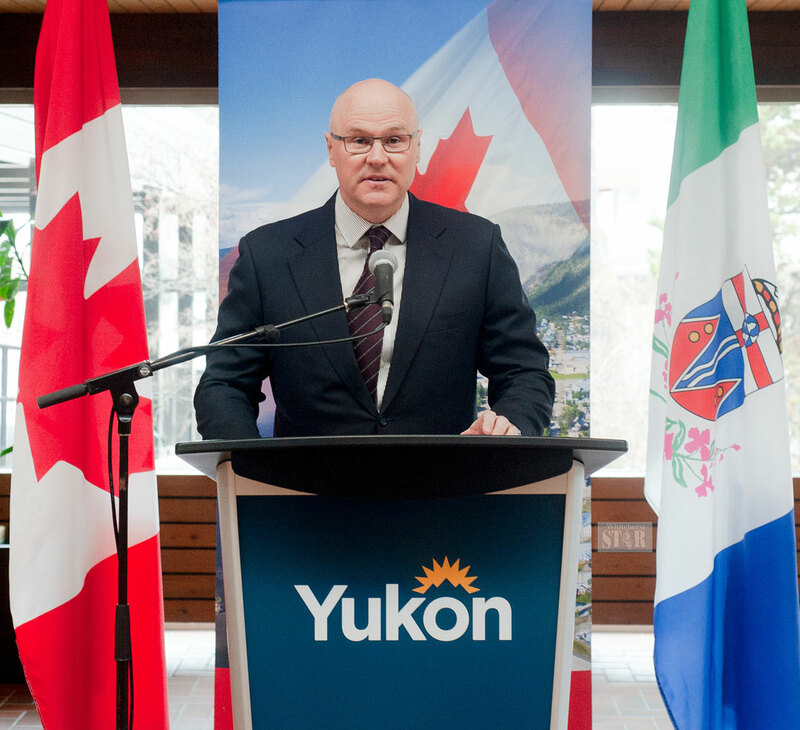 Yukon Energy president Andrew Hall, MP Larry Bagnell and Ranj Pillai, the minister responsible for Yukon Energy, announced the program at a news conference. The federal government is contributing $650,000, and the Yukon government $250,000. ATCO is chipping in $300,000 and Yukon Energy is providing $100,000 plus in-kind services. “If the project is successful, it can be rolled out across the territory,” Bagnell told the audience gathered in the lobby of the Yukon Government Administration Building. The Liberal MP reminded the audience of the recent report on climate change that says the Canadian North is warming three times faster than the rest of the world. Finding ways to reduce demand on the grid during periods of peak demand at breakfast and supper is a means of reducing greenhouse gas emissions from diesel and natural gas generation, Bagnell said. To participate in the project, Hall explained, homes must be heated with electricity and must have an electric hot water tank. The intent is to install smart devices that will allow Yukon Energy to turn off the electric heat and hot water tanks prior to peak demand, Hall said. He explained Yukon Energy will heat up the homes to two or three degrees above normal prior to peak demand, then shut off the heat during the peak period. In the case of the afternoon, for instance, Yukon Energy will heat up the home an hour or so before the 5 p.m. supper time peak, he said. By turning off the heat during the peak, Hall said, it’s hoped they’ll be able to shave the demand when it is at its greatest. That would reduce the amount of dependency on fossil fuel generation needed to augment hydro generation during the cold winter months. Saving one or two kilowatts of energy per household does not seem like a lot, Hall said. But if you add the savings from 400 homes, they could approach a megawatt of generation, he explained. Yukon Energy estimates the pilot project will likely reduce greenhouse gas emissions by somewhere between 3,600 to 7,200 kilograms per year. Hall explained they’ll be reaching out for volunteer homes later this year, with plans to have the smart devices installed this fall prior to the winter months. They’re hoping to have participation from a good cross-section of homes across the territory, he said. Hall explained the project is expected to provide the two utilities with enough information to go before the Yukon Utilities Board with a case for expanding the use of smart devices across the Yukon, if the project proves successful. The mechanisms are also equipped with a switch that will allow homeowners to turn it off on any given day if they choose to, for one reason or another, he said. Pillai told the audience the Yukon not only needs to focus on generating electricity with renewable sources of energy, it also needs to focus on managing the electricity it’s producing currently. The funding will be used to purchase and install the necessary equipment, he explained. Yukon Energy typically requires fossil fuel generation in the winter months when the availability of water for its hydro dams is at its lowest. This morning, for instance, 26 per cent of the total generation was being provided with fossil fuels. Smart home management works if done properly. I have seen some in Europe and in the U.S. years ago. But climate change because of carbon is not true and Trudeau is just putting out facts in Canada that does not hold up. For example, Canada has not warmed up in the last 25 years. Everyone needs to read...Agenda 21 sustainable development....there are many movies and documents on this...everyone needs to look into this and all this smart technology is being implemented everywhere. There is a lot of confusion about this program. When is YEC going to actually have a public meeting about the Future of the Grid? We need a smart grid but it doesn't have to be so intrusive. I know villages in Alaska who have their heat controlled by the utility and they get all the heat they need and a cheaper price because it is interruptible and they have heat storage in their homes. There needs to be way more education for and between Government, citizens and utilities, if we are to address Climate Change. Juneau has been controlling hot water tanks for generations, time to catch up. "Pilot project." In other words, this project will be engineered to "succeed". Then, ATCO and the YTG will push this technology on the rest of us and then we are one step away from Ontario's nonsense. Yet more rate hikes will be coming to "incentivize" residents to shift their electrical consumption. What ATCO and the government doesn't tell you is this: the vast majority of people CANNOT shift their electrical consumption. So, this will just become another tax grab. Besides, didn't ATCO reassure us we wouldn't be getting SMART meters? Just say "no" to SMART meters and time-of-day pricing. I believe government buildings should all be equipped with demand-side energy reduction apparatus programmed to efficient duty cycles while the buildings are unoccupied. Also commercial freezers and coolers as in all of our local grocery stores should be equipped with programmable timers to reduce consumption. All the money from the Carbon Tax could be applied to solutions such as these if government was sincere about making a difference rather than just getting more of our money for their "other" purposes. Man these guys are thick. YEC can sell electricity at a premium during peak hours and at a cut rate during off peak hours. Would I run it on delay while I'm sleeping if it was cheaper? Yup. Also, build another Hydro Electric project, something you should have done 20 years ago. I am all for smart technology, however, I do not think that someone (a Corporation) should have that type of control especially over HEATING in a persons dwelling, Education is better. If I was to sign up, yes you can install the smart system, but I HAVE THE CONTROL not you or anyone else. Even though you say there is a switch that the volunteer can turn off at "anytime they wish", you can see the consumption etc. Plus it does actually cost more to "heat up an extra couple of degrees", turn it off and then when turned back on it still has to regain what was lost (the extra cooling degrees) and then the normal running time to get back to the maintained temperature of the dwelling. I think they should rethink this a bit and maybe leave the control to the users but have the ability to monitor and get some initial data before trying something like they have proposed. Most energy is used/lost is when people are at work and forget to turn down thermostat and instead of it being at 18 degrees it maintains a constant 20 degrees when no one is even present in the building. Maybe focus on that instead of the proposed time frames especially if you plan on running this in the winter months. Why is the only focus is on Peak hours?, as those are Peak hours for a reason, people are returning home from work, getting things turned on, preparing meals, bathing children - oh yeah turn off the water heater so there is no hot water when its time for bathing and bed for most people with children. I feel that its a good idea but definitely needs some modification to the actual proposal. Soooo.. The Liberal government is going to control how much heat a person can use. Controlled by Atco. I can see it now. Someone else determines how much heat you need to be warm, and if you use more heat, you pay more. In the end, the only people who will be warm in winter will be the people that don't pay for their oil or gas or hydro. Something happens to people once they have power over other people. Control and perceived power is everything. Try to control how much, and what food you eat by taxing the crap out of it. what drugs you can or can't take..formulary.. even if you live or die..yup. I personally know a woman, Edith, passed away now. She was told to move to Vancouver if she wanted to live, YTG was not going to pay for her travel anymore for treatment. Leave her family and home, friends, another senior. She came home to die. Control, control, control. I read the news, and I think sometimes, mankind does not deserve to survive. Boy am I glad I don't have electric heat. Our little dictatorship can't shut my heat off. If we are using too much power at meal times why doesn't Larry stay in Ottawa. That would help. Save the power for us working types. Should we cobble together some cow dung and cook over that?? Really guys are we no longer a first world country? Bye Bye Larry. It has been a slice. Trudeau too. Wouldn't work for us. My wife and I come and go at different times. Plus our dogs and plants like to stay warm as well. Why don't you turn off the heat at all the Government buildings instead? We work hard and would like to be a bit comfortable when we are resting to toil for our Tax collectors once again. Please masters, just a little heat, that is all we ask, help us stop our Bread and Water from freezing. Do the math, that's $3250 per house. It sure smells like another greenwashed boondoggle. Simple timers on hot water heaters to turn them off during peak demand times wouldn't cost that much, would cause very little inconvenience to most users, and would significantly reduce peak demand. This simple demand reduction option has been available for decades, so we can't help but wonder what the real agenda is. Hot water heaters are the least expensive and easiest to control with the greatest savings. Some utilities have been doing it since the 70s with simple timers. Why YE hasn't picked this 'low hanging fruit' long before now is inexplicable. For $1.3-million they could probably do all the hot water heaters on the grid the 'old fashioned' way with timers. This is a greenwashed boondoggle for political reasons in an election year, and to justify future use of expensive troublesome 'smart meters' we don't need, not to save the most energy. First, the problem of grid overload is created by incentivizing the use of electric heat in new construction and banning other forms of heating (oil, wood). Then the reaction is created when the utility opts to generate power using a non-renewable type (LNG, rental diesel gensets) while not building a new renewable hydro project to cover the above mentioned spike in electrical demand. Now, here we are. The solution? Give the utility full access to all your appliances so THEY can decide how much power you can use. Washing clothes in the morning? Shut it down. Watching the Super Bowl, not when it’s -35 out and all 3 LNG plants are running. Your energy star appliance that you got a 10$ rebate on, was solely designed to be remotely accessed for the above purpose. It’s much cheaper to control what exists than to build new and solve the problem. So they are asking volunteers to give control over their home to the government and trust that they won't screw this up. This has so many red flags. What happens when the "test" ends? Will people get control of their homes back? There is zero incentive to participate. The potential for overreach is astounding. I would vary much like for this liberal government to stay out of my home.